You could say our trip to Madrid last year was one extended tapas crawl. Most meals, we found ourselves trudging up and down the city in search of tasty little bites. These were among our favorites. Having just arrived the evening before, we are still getting our bearings around the city and happily chance upon this trendy spot just around the corner from our hotel on Paseo del Prado. Manitas de Cerdo Iberico (front). 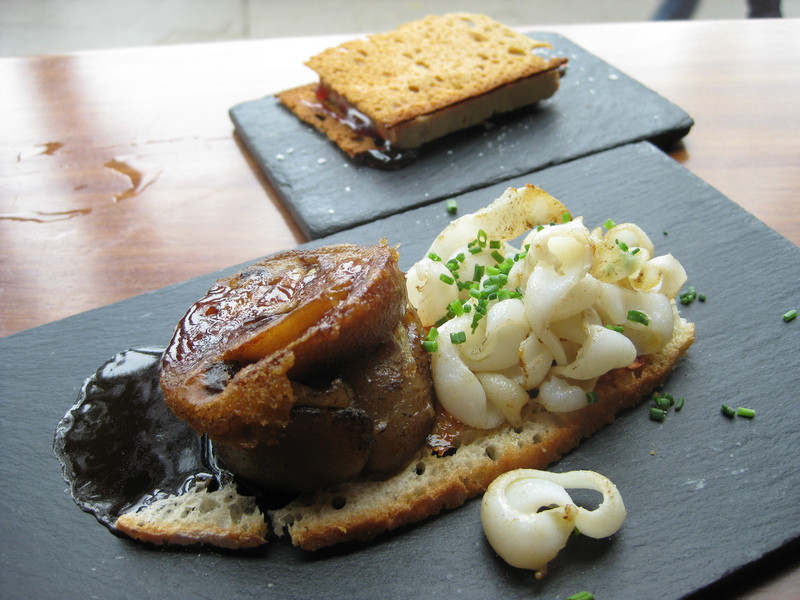 This slice of pig’s trotter is suitably gelatinous and the cuttlefish noodles remind me of a similar dish we had in San Sebastian. Corte de Foie Gras con Pan de Especias (behind) is a thick slice of foie gras smeared with membrillo and sandwiched between two thin slices of crispy spiced bread. Classic Madrid fare consisting of tripe, chorizo, morcilla, and garbanzos in a tomato sauce. Best version we had this trip. The ubiquitous pastry shop is our favorite lunch spot. It’s fast and cheap, allowing us to quickly get back to sightseeing. 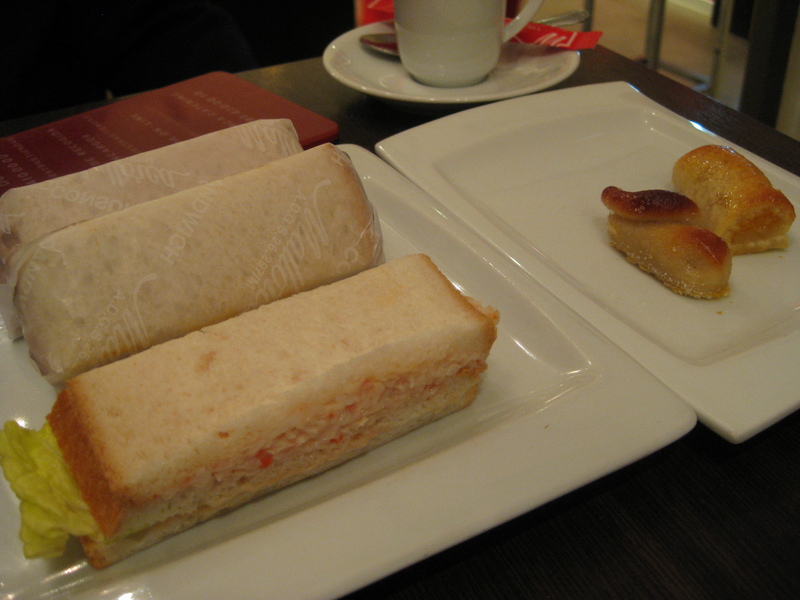 I can’t get enough of their dainty little sandwiches individually wrapped in waxed paper. 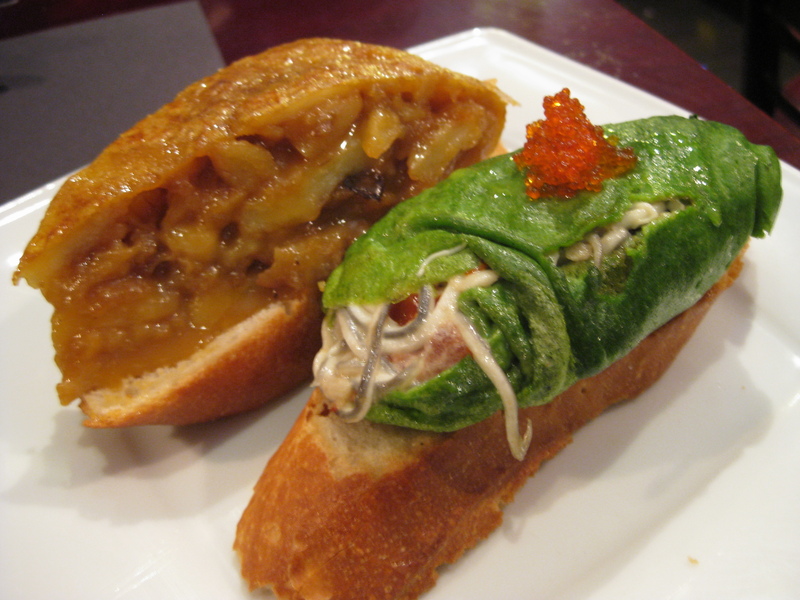 There’s an assortment of fillings like crab, tuna, smoked salmon, etc. At 1 EUR each, it won’t break the bank to try them all. On one corner of Puerta del Sol is La Mallorquina, one of Madrid’s oldest and most popular bakeries. The ground floor is the bakery and coffee shop while the top floor houses the restaurant. It’s a zoo this Saturday morning. 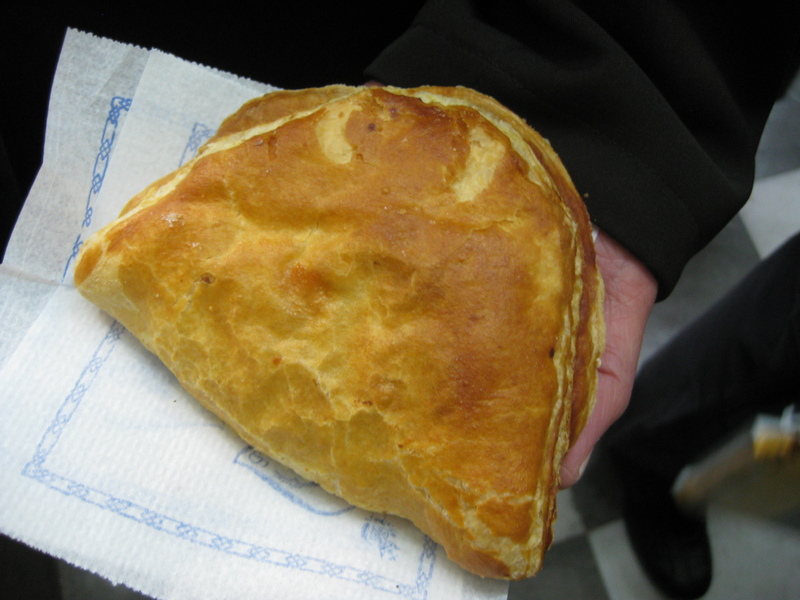 Nevertheless, I’m not going to come way empty-handed so I join the frenzy inside and make out with a giant empanada de atun con pimiento (tuna with red pepper). It doesn’t matter that we were off to meet friends just a few hours later for lunch. 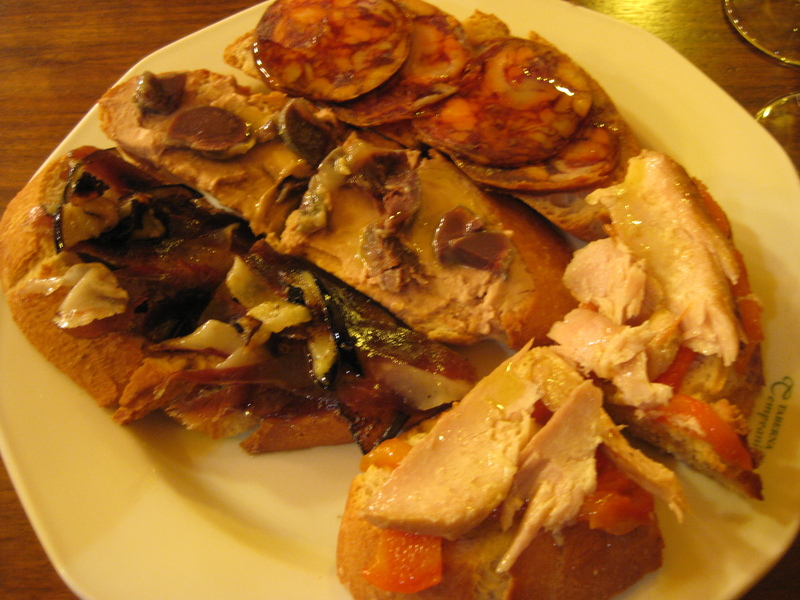 Asturian food in the Tetuan area of the city. Unfortunately, I didn’t take any pictures since I was meeting my husband’s colleague and his wife for the first time. He orders quite a spread: jamon iberico de bellota, chorizo, a calorific roto juevos con patatas jamon y pimiento de padron (fried eggs, ham, small green peppers on a bed of fried potatoes), fabes (short for fabada, an Asturian stew with salt pork, morcilla, chorizo and beans the size of my thumb). And these are just the starters! Upon learning via text that we were in Madrid, a friend from Manila who counts this as her favorite city instructs us to “look for the bar that serves really great grilled sardines, pimiento padron and calamares. They only open on Sundays. It’s at the top of the Rastro in front of a belt stall”. We think she was referring to Cruz Raciones except that it is open all week. Oh well. Two out of three ain’t bad. 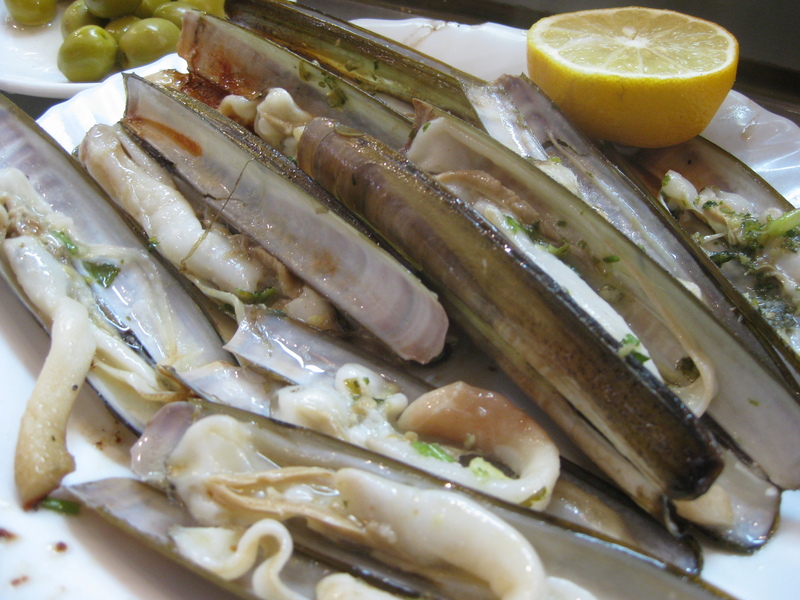 In addition to the grilled sardines and pimiento de padron, we also have a plate of setas ala plancha (wild mushrooms) and a dozen really fresh navajas ala plancha (razor clams). Only a squeeze of lemon and some minced parsley as garnish. We eat on the counter standing up (no chairs or stools) and curiously point to what looked like a phyllo pastry twisted around a stick. It’s lamb stomach, we are told. It’s only 8:30 pm. That must be why we’re still able to get a seat at Taberna Tempranillo, one in a string of tapas bars along Calle Cava Baja. 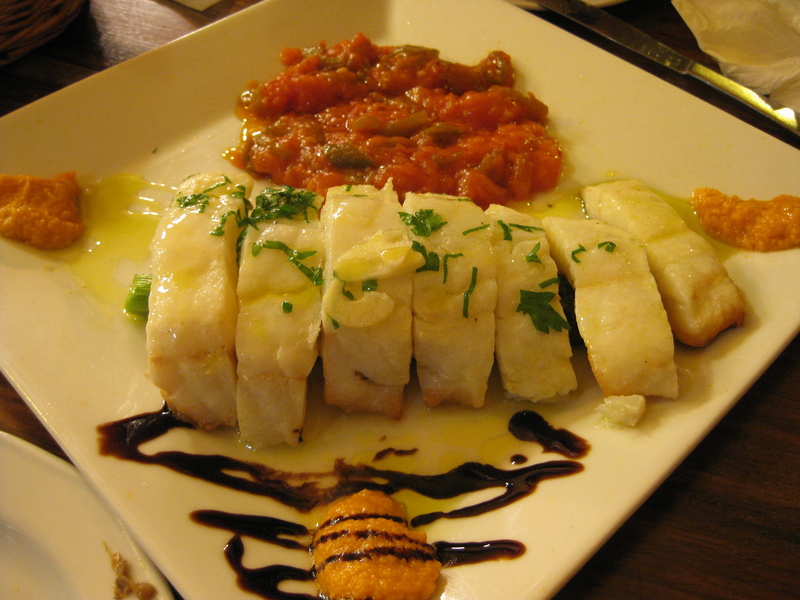 Salteado de Lomo Fresco de Bacalao con Trigueros (Bacalao with Asparagus). I have no idea how they reconstitute this center cut dried cod, but it’s as good as fresh. 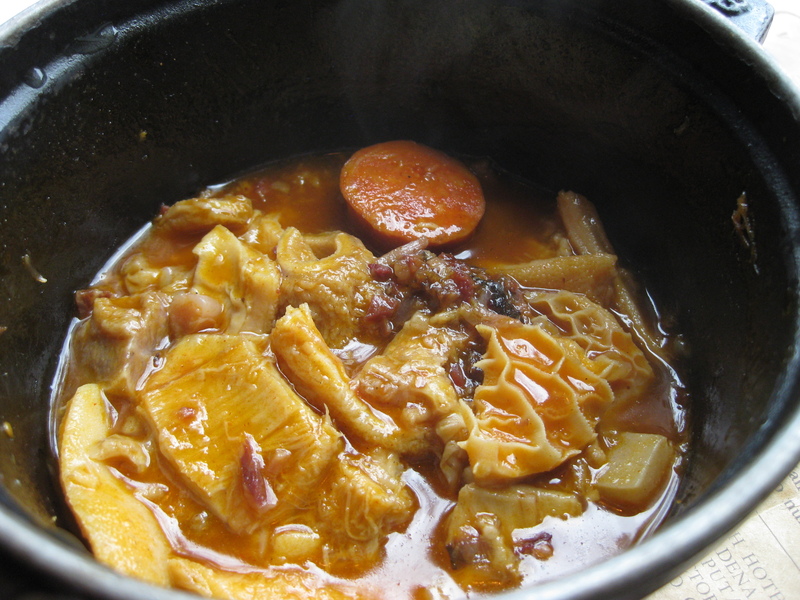 The meat flakes with a fork but retains its delicate texture. 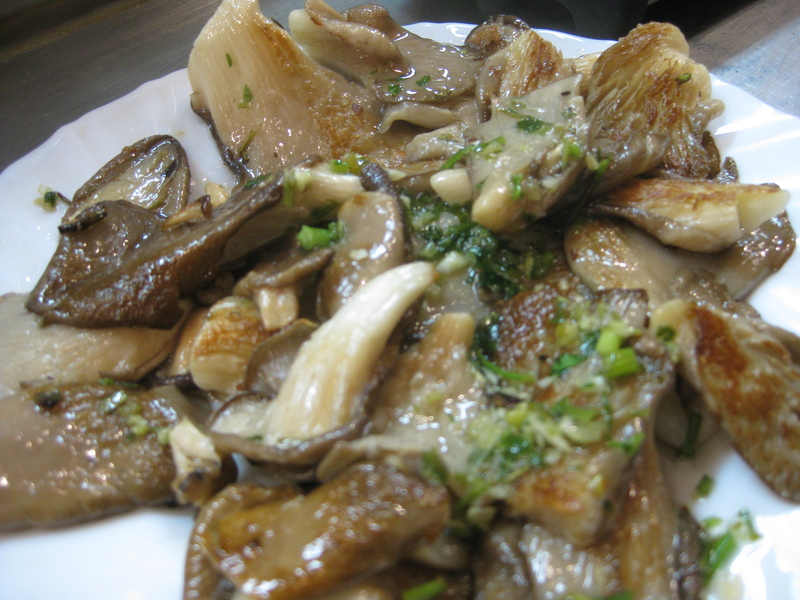 Revuelto Tempranillo (Scrambled Eggs with Porcini Mushrooms). A specialty of the house. Across the street from Taberna Tempranillo is Jamon Julian Becerro, a specialty store selling various permutations of jamon. 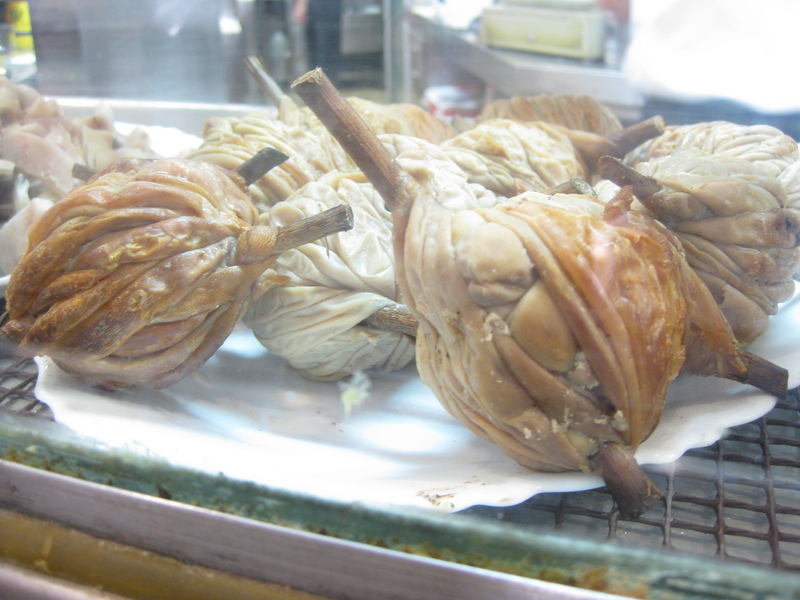 They have several legs ready on display and they’ll carve off thin slices according to your order. While the price per kilo can be rather scary (most expensive one was about 120 EUR/kilo), their minimum order of a 100 grams is about 12 EUR and that is plenty of jamon for two people. 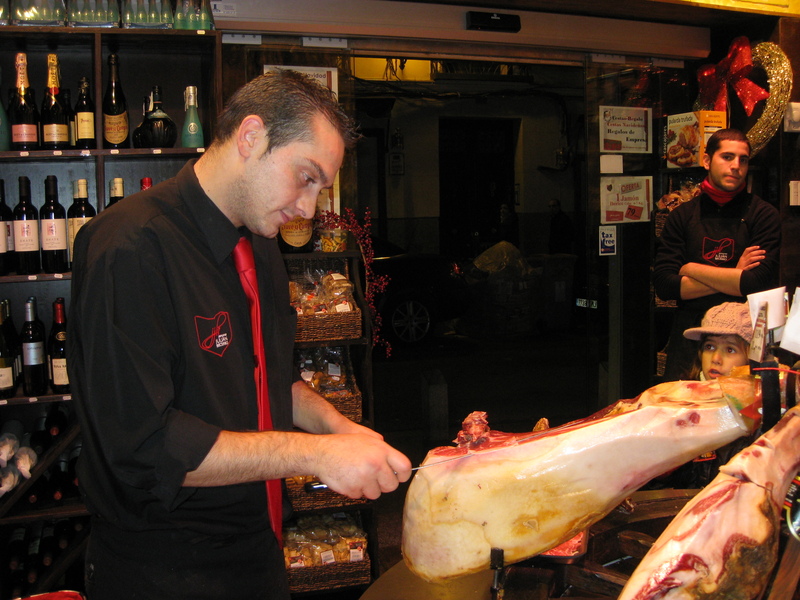 As the guy prepares our Jamon Iberico de Bellota, we learn that the best ones come from the Extremadura region of Spain. We take our 100 grams vacuum-packed to go. It’s tomorrow’s breakfast. There are three branches in the city. The one we visit, along General Diaz Portier, takes reservations. It’s a narrow storefront space that’s already packed, but we are led downstairs to a slightly larger room with dining tables and chairs. The menu is written on a blackboard at the far end of the wall. Tapa de Rabo con Crema Trufa y Huevo de Cordoniz. 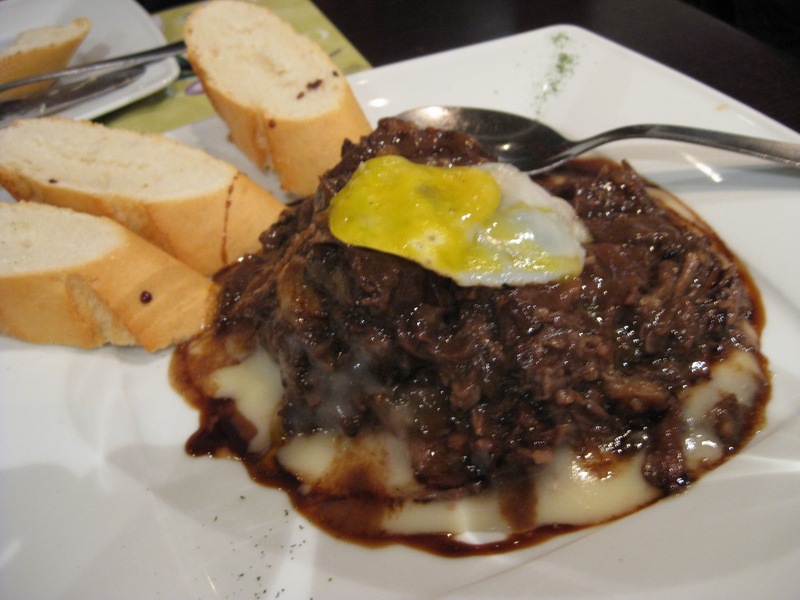 Similar to a ropa vieja but with shredded oxtail. And that’s fried quail’s egg on top. Very hearty and delicious. Near the Plaza Mayor, this enclosed market is more a collection of food stalls than a true market per se (even though they do have a fish monger on premises). It’s packed during lunch hour, and we’re lucky to find a corner to park ourselves and eat standing up. A sampling of croquetas from a food stall selling nothing but that. My favorite is the negra which is flavored with squid ink. 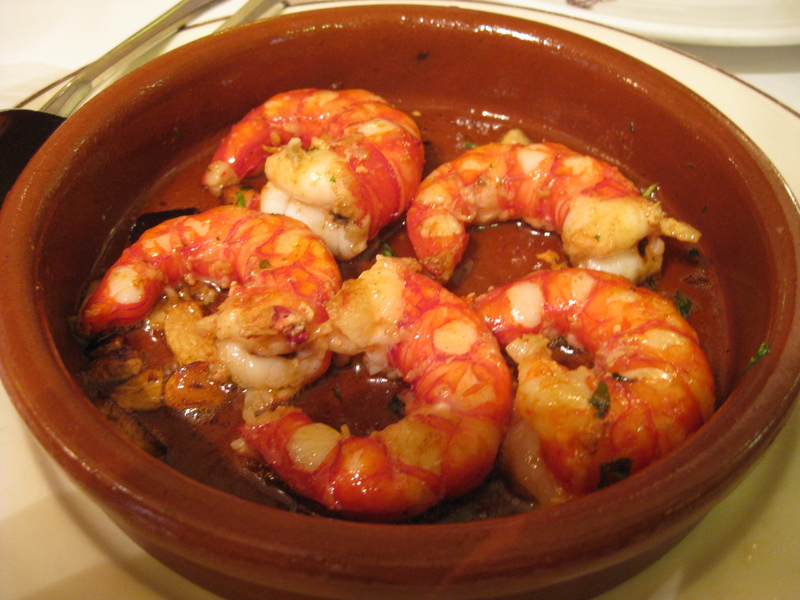 Named after the first Spanish queen, Joanna, who went mad after the death of her husband (or perhaps it was due to his numerous extra-marital affairs), this tapas bar on Plaza Puerta de Moros at the end of Calle Cava Baja is anything but stuffy. In fact, it’s got a really funky downtown vibe to it. Tortilla de Patatas & Cebolla Confitada. 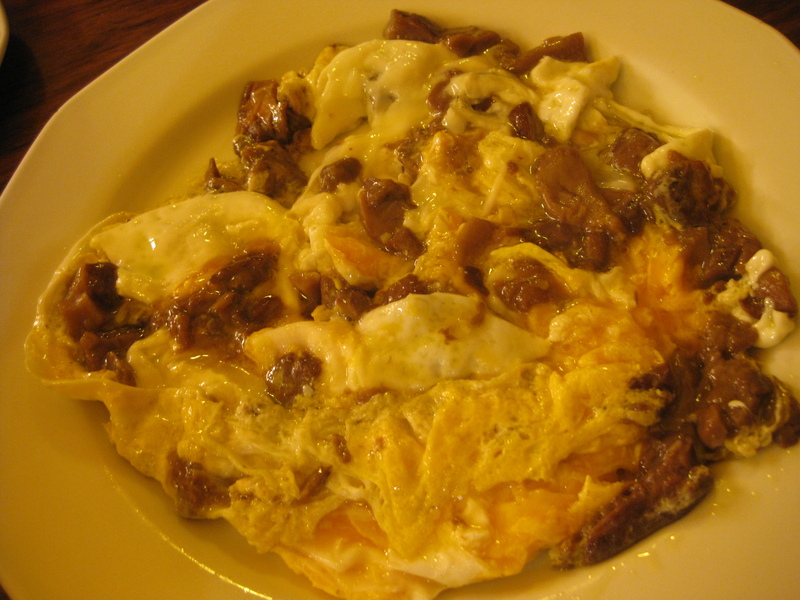 A specialty of the place, the caramelized onions make this a rather sweet version of the tortilla espanola. Crepe de Espinacas con Gulas al Ajillo & Esparragos Trigueros. The spinach crepe is stuffed with baby eels. Kokotxas de Bacalao Rebozadas Crujentes. 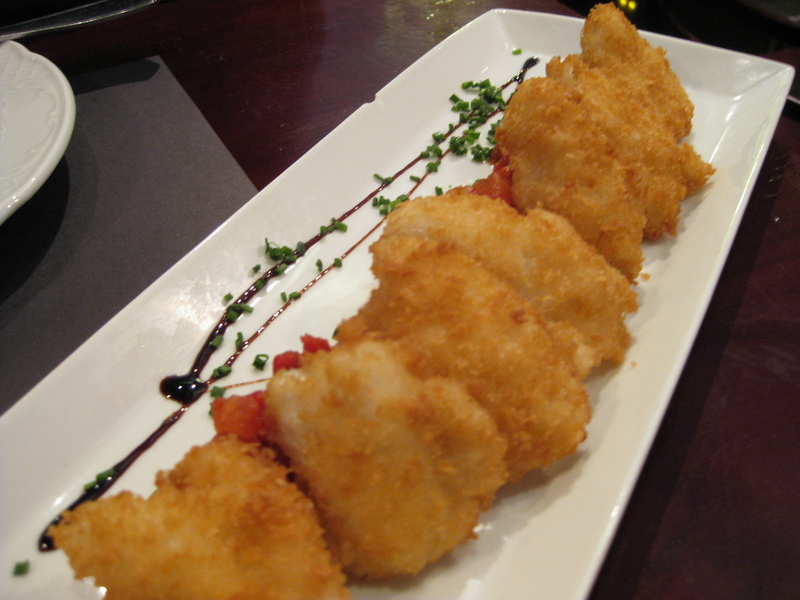 Cod cheeks lightly breaded and fried. Tallarines Caseros con Muselina de Yema & Trufa Negra. Tagliatelle with egg yolk and black truffles. This one’s outstanding. 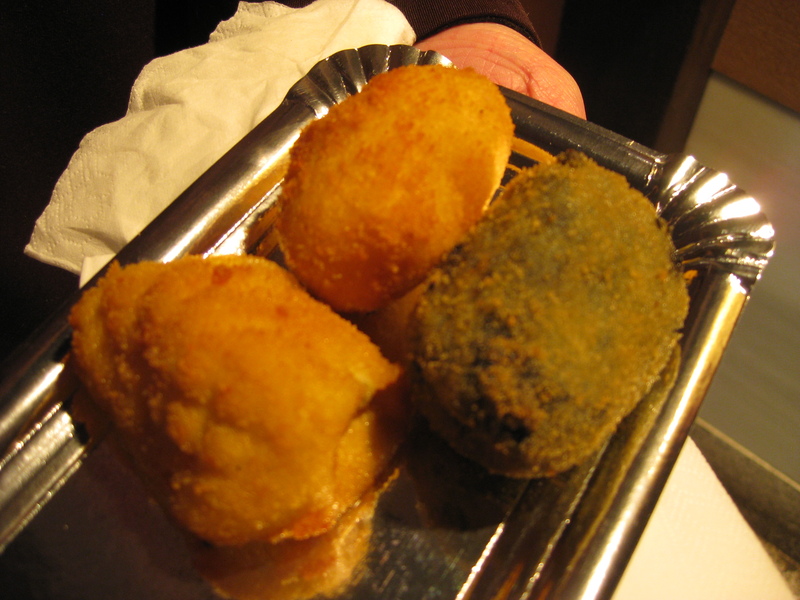 Also along the Cava Baja, La Camarilla’s menu is more slanted towards raciones. 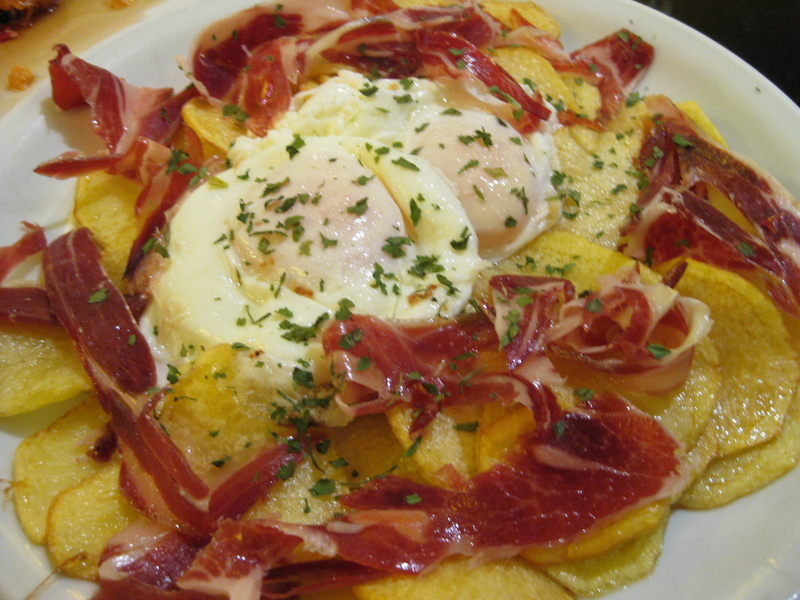 Huevos Estrellados con Jamon Iberico. This looks like breakfast fare, doesn’t it? This isn’t really a tapas bar but a paella restaurant recommended by the same friend who told us about the bar by the Rastro. Carabineros al Ajillo. I’ve seen raw carabineros at the market and their shells are an angry fire engine red. They are definitely more flavorful and assertive than the frozen/thawed ones we see in the Northeast US. ~ by Jaded Fork on May 18, 2011. Wow, lots of terrific eats here!